TALLAHASSEE – At the Florida Ports Council Annual Board Meeting today, Port Everglades Chief Executive/Port Director Steven Cernak was elected chairman. Port Tampa Bay Director Paul Anderson’s term ended as of this meeting. PortMiami Port Director and CEO Juan Kuryla was elected as vice chairman and Port of Palm Beach Executive Director Manuel Almira was elected secretary/treasurer. All positions serve one-year terms. Cernak joined Port Everglades in March 2012, previously serving as the port director and chief executive officer for the Port of Galveston, Texas. He also served as president of the Galveston Port Facilities Corporation, a nonprofit corporation formed to promote redevelopment at the Port of Galveston and related entities. In addition, Cernak has held the position of manager of port development for The Port Authority of New York and New Jersey. He has also worked in engineering positions with several private engineering consultancies in New Jersey. Cernak is an active member of the American Association of Port Authorities and has been selected as the association’s chairman of the board for the 2017-18 activity year, beginning in October. The Florida Ports Council is the professional association of Florida’s public seaports, providing advocacy, leadership and research on seaport-related issues before state and federal government. Florida’s ports support nearly 900,000 jobs in the state and contribute $117.6 billion to the state’s economy each year. The Florida Ports Council administers the Florida Seaport Transportation and Economic Development Council, which is required to provide a 5-year Florida Seaport Mission Plan annually according to Florida Statute. For more information, visit www.flaports.org. 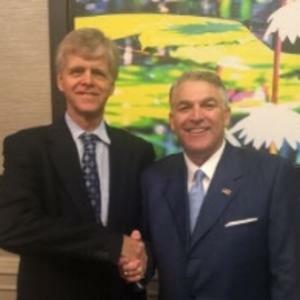 PHOTO CUTLINE: Port Everglades Chief Executive/Port Director Steven Cernak, newly elected FPC chairman; and Port Tampa Bay Director Paul Anderson, FPC immediate past chairman.